After arriving to the MTV Studios in New York City yesterday wearing Louis Vuitton, Lady GaGa changed when she made her guest appearance on MTV News. 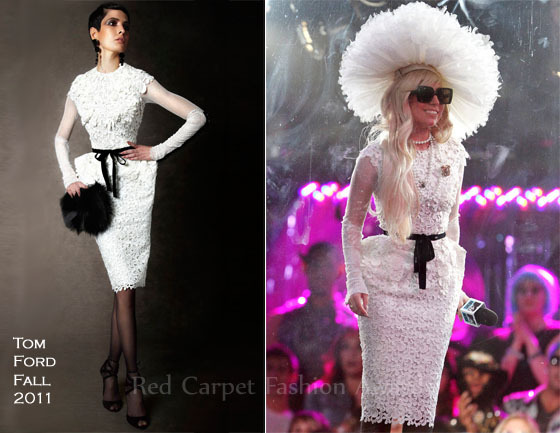 GaGa wore a white lace Tom Ford Fall 2011 dress with sculptured hips. You may remember that Emma Stone recently wore the black version of this dress to the “Crazy, Stupid, Love” World Premiere sans sleeves. I love that GaGa kept the sleeves, because of the way she accessorized the look with pearls and gold brooch which gave her modern look a vintage vibe. The only thing that doesn’t work for me is the heavy black tights despite the black ribbon accent. Lady GaGa will be opening the 2011 MTV Video Music Awards which will be held at the Nokia Theatre in LA on Sunday, August 28. Viewers in the UK can catch the show on Monday, August 29th at 9pm. NEXTJennifer Aniston to star in soap with her dad?